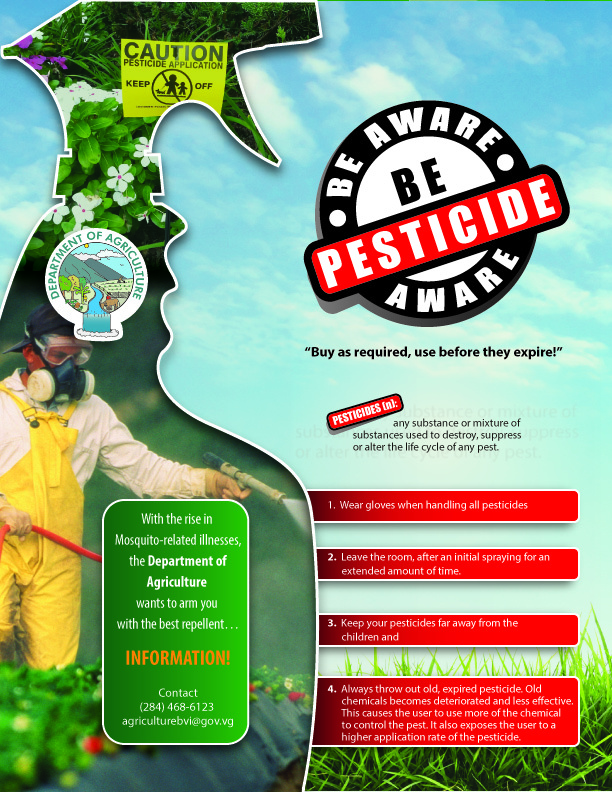 Residents of the Virgin Islands will benefit from information on how to properly utilise pesticides, and manage and dispose of these products after they are expired, through activities in observance of Pesticides Awareness Week. The week of activities is hosted by the Department of Agriculture and will begin on September 27 to October 3 under the theme, “Children are Precious: Protect them from Pesticides”. Deputy Chief Agricultural Officer, Mrs. Arona Fahie-Forbes said pesticides in simple terms are chemical formulations developed in a laboratory to kill unwanted pests. Mrs. Fahie-Forbes is advising pesticides users to wear protective gears such as gloves and masks when using products such as Clorox, Fabuloso, Baygon, Bop, furniture polish and dishwashing detergents. These products she said are harmful and can enter the body by inhalation (through the lungs), through the skin (dermal) and by the mouth (ingestion). The Deputy Chief Agricultural Officer added that gloves, respirators, boots and coveralls should be used when applying products such as sevin powder or liquid, in the field. Activities for Pesticides Awareness Week include visits to primary and secondary schools, an educational skit centred on the theme, and Quarantine Awareness Day activities. Quarantine Awareness Day is scheduled for Wednesday, September 30. The department will be stationed at the West End and Road Town Ferry Terminals and the Terrance B. Lettsome International Airport educating the public on the requirements for importing and exporting agricultural produce and animals into and out of the Territory via these ports of entries. The Department of Agriculture aims to provide the medium to increase agricultural production, create a safer household and a more sustainable environment within the Territory. It also aspires to bring about greater public awareness to the populace on agriculture and its services.